UPDATE: Gov. Nathan Deal of Georgia has issued a State of Emergency for 92 counties ahead of Hurricane Michael. Note: While there is no legal prohibition to solicitation calls to Florida, Alabama or Georgia, these states are in declared states of emergency due to Hurricane Michael. We recommend you exercising caution before contacting consumers in affected areas. As of midday Tuesday, Gov. Nathan Deal of Georgia has declared a state of emergency for 92 counties. Florida Gov. Rick Scott and Alabama Gov. Kay Ivey issued states of emergency on Monday afternoon as Hurricane Michael continued to strengthen into a Category 2 hurricane. Hurricane Michael is now expected to reach Category 3 hurricane strength with winds of 111-130 mph before making landfall near Panama City, Florida on Wednesday midday or early afternoon. Destructive hurricane-force winds, power outages, torrential rainfall and storm surge flooding are expected near and east of the eye of the storm, along part of the upper Gulf coast of Florida. 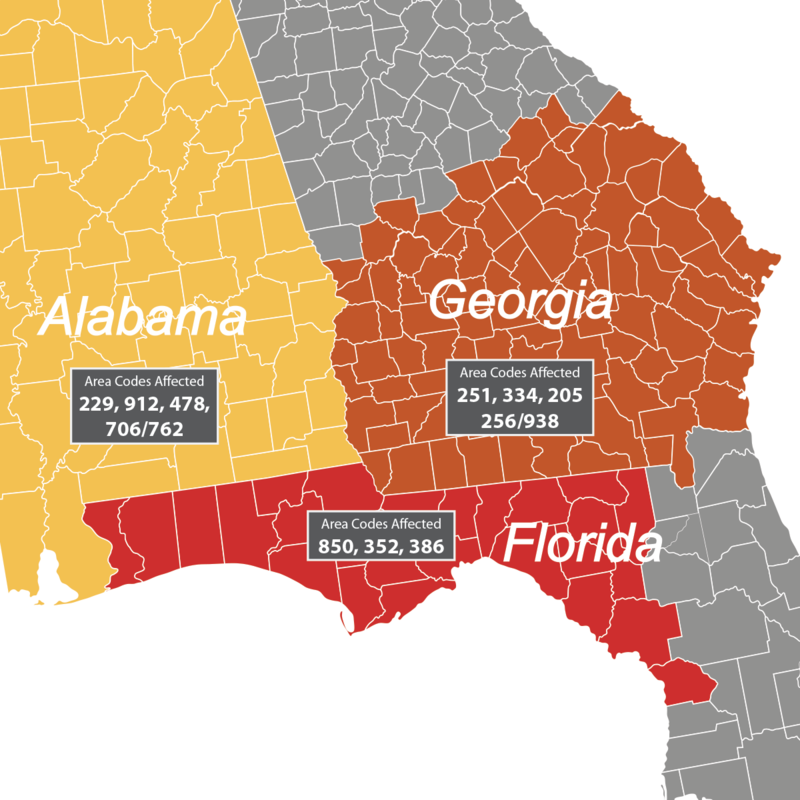 Affected Georgia area codes include: 229, 912, 478, 706/762 and counties in declared states of emergency include: Appling, Atkinson, Bacon, Baker, Baldwin, Ben Hill, Berrien, Bibb, Bleckley, Brantley, Brooks, Bryan, Bulloch, Burke, Calhoun, Camden, Candler, Charlton, Chatham, Chattahoochee, Clay, Clinch, Coffee, Colquitt, Cook, Crawford, Crisp, Decatur, Dodge, Dooly, Dougherty, Early, Echols, Effingham, Emanuel, Evans, Glascock, Glynn, Grady, Hancock, Houston, Irwin, Jeff Davis, Jefferson, Jenkins, Johnson, Jones, Lanier, Laurens, Lee, Liberty, Long, Lowndes, Macon, Marion, McIntosh, Miller, Mitchell, Montgomery, Muscogee, Peach, Pierce, Pulaski, Quitman, Randolph, Richmond, Schley, Screven, Seminole, Stewart, Sumter, Talbot, Tattnall, Taylor, Telfair, Terrell, Thomas, Tift, Toombs, Treutlen, Turner, Twiggs, Upson, Ware, Warren, Washington, Wayne, Webster, Wheeler, Wilcox, Wilkinson and Worth counties. All of Alabama is in a declared state of emergency. Affected area codes include: 251, 334, 205, 256/938. The heaviest rain is expected to fall in areas that were missed by Hurricane Florence and focused from the Florida Panhandle to southwestern and central Georgia to part of central South Carolina. Approximately 120,000 people along the Panhandle have evacuated. Apalachee Bay and the stretch of coast between Cape San Blas and Fort Walton Beach, Florida are expected to be hit with a significant amount of storm surge flooding that may range between 8 and 12 feet. More moderate coastal flooding is expected south of Tampa, with some impact possible as far south as the Florida Keys. Poor travel conditions are expected to reach as far west as Interstate 85 as Michael rolls northeastward. U.S. Route 98 and I-10 in the Florida Panhandle may be dangerous and should be avoided on Wednesday and Thursday. Residents in parts of Georgia, the Carolinas and south east Virginia should prep for outages due to fallen trees and downed lines due to saturated grounds. Hurricane Michael’s total damage and economic impact in the U.S is expected to be close to $15 billion.